Who among us saw the last movie entry into the Star Trek Universe? I remember having some skepticism when I first heard there would be a reboot, but all that was washed away with the incredible script, acting, and knock your socks off special effects. For those of us who are eager for the next movie release and need something to get you by there is the latest Star Trek series from IDW, written by Mike Johnson and drawn by Joe Corroney. This series ties directly to the movies and gives us some additional background and adventure, but does it hold up? Let us discuss! Issue six ends a fairly light tale with a very non-complicated plot. Annoying creatures much like a virus have infested a planet and are endangering the population. A pretty straightforward “there’s a problem and we must fix it” sort of a dilemma. The nuggets to pull from this story have to do with Captain Kirk’s background, and the always fun sarcastic humor from Bones. I wouldn’t say the issue blew me away, but I still had fun. Mike Johnson’s dialogue with the characters comes off as a little stiff at times, but I like what this tells us about Captain Kirk. Overall, I came away wanting more…something to give the story more depth and substance, but maybe this is leading up to something greater. The teaser for issue seven is “Vulcan’s Revenge” so you can imagine the weight that may carry, you know, that little annoyance of having their planet blown up? Corroney’s pencil was superb. He totally gives me the John Cassaday vibe with whom I’m more familiar with. The line is really smooth and no character has features that are overly exaggerated. Personally, I’d like to see more of Corroney! So, should you buy this? 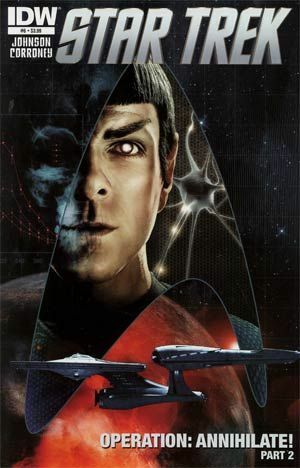 If you are an avid Star Trek follower, and want more than what the latest movie canon has given then you should. If you’re looking to start something new, you may want to go back a few issues to help yourself understand just what is going on here. If you can’t do that then I would suggest jumping on in issue seven (next issue), where a new story arc starts. Personally, as a casual “trekkie” I expected just a little more than what this gives, and hope to see more sophisticated plots in the near future! Parental Concern: None really…unless squishy aliens make you squeamish! Star Trek #6, written by Mike Johnson and drawn by Joe Corroney, can be found at your local comic store on February 29, 2012, from IDW!